When I was in fourth grade my grandfather fell ill, and because we needed money for hospital bills, I had to leave school. I worked on our farmland, helping my family plant corn and cotton. When I was in fourth grade my grandfather fell ill, and because we needed money for hospital bills, I had to leave school. I worked on our farmland, helping my family plant corn and cotton. Eventually, my parents decided to send me to Wudang Mountain to study martial arts. I was a very active child, much harder to contain than my brothers. It was also my parents’ hope that if a member of the family were good at martial arts, the local villagers wouldn’t bully us. As a boy, I used to walk for hours to watch kung-fu movies on the only TV in the area. I was always fighting with my brothers in our family’s front yard. So, when my parents asked if I’d like to go study, I readily agreed. My father managed to borrow some money from a distant relative, and we headed out on a two-day tractor, bus, and boat trip that took us to Hubei Province. 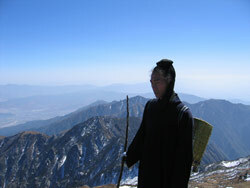 The only martial arts school actually located on Wudang Mountain was the Wudang Daoist Association School. We lived and trained at Purple Cloud Temple under Zhong Yun Long. He trained with Guo Gaoyi and Zhu Chende and had spent three years traveling around China, searching out the Wudang practitioners who had gone into hiding during the Cultural Revolution. The tuition at that time was about 1,200 Yuan per year, about $170. In addition, we had to pay 25 Yuan per week for food. Though it doesn't sound like much, it was difficult for my parents to pay so much money. I was by far the poorest student at the school. I remember that when I got there all I had was one worn out pair of pants, not suitable for training in. I also didn’t have a plate to use at mealtime. Lucky for me, the other students were kind and gave me what I needed. When I first arrived at the school, there were over 40 students. Twelve of us shared a bedroom. Being 13, I was among the youngest. Most of the students were around 18-19 years old. Many students complained about the food. Where I’m from, the staple food is noodles. But, in Hubei Province they eat rice. I found rice hard to digest, and felt nauseous for weeks. I also wasn’t used to eating meat. On our farm we had animals, but they were all sold in the markets. We ate meat maybe once a year. At Wudang we had meat three times a week. Many people found the lifestyle difficult to adjust to. Out of the 40 original students that were there when I entered the school, only 20 returned the next year. By my second year at the school, I had proven myself as a serious student, and my tuition was waived. By the third year, there were less than 10 of us remaining. I think it is safe to say that at Wudang Mountain, for every 200 students who train there, maybe one or two end up sticking it out. The practice was very bitter. We would wake up at 5 am, and begin by working on our flexibility. For about half an hour we would practice splits and other stretches. I remember we would fall asleep while in splits. After stretching we would do some basic conditioning; standing in horse stance, or doing push ups. We would stop for breakfast at 7 am, and at 8 am begin the stretching and conditioning all over again. We would also drill basic kicks and punches. The older students, who stood on the sidelines with thick wooden rods in their hands, supervised our morning practice. Their favorite thing was to find one of us slacking. We had class seven days a week. But, we always had a vacation during the Spring Festival. Also, sometimes when they saw that we were exhausted, we’d all be given a day off. I remember that on my third day, my legs were badly swollen from over-exertion. But, of course, I had to keep on practicing. That night, I was so tired that I couldn’t raise my legs to get into bed. I had to lift them with my hands. I was still young at the time, and would sometimes cry at night. The winter was the worst. In addition to training, we had to go collect firewood on the mountain. Every student had to collect 30 kg. of wood each day. I will never forget the day when I was so tired while collecting firewood that I fell asleep in the snow. But when I woke up, there was a pile of firewood next to me. An older student had collected it for me. After three months of conditioning, we started learning our first form. It’s a short combination of the basic punches and kicks. Nowadays when I teach, most of my foreign students feel satisfied with it after about a week, but when I was learning, we drilled the form to perfection, practicing it for more than six months. To this day, I feel that of all that I’ve learned, those basics are the most important. But at first, I was too young to appreciate what I was learning. While I was used to hard work, having grown up on a farm, I often got very home sick. So, towards the end of the first year I decided to run away. I made it all the way home to our village in Henan province, but when I got there, my father yelled at me and sent me back. Of course, when I got back, I was yelled at again. Zhou, Xuan-Yun is the author of the Wudang Taijiquan DVD.